What does the anatomy of the ear look like? What kind of doctor treats tinnitus? What home remedies soothe tinnitus symptoms? Is there surgery to cure tinnitus? What is retraining therapy and relief therapy? Does acupuncture treat tinnitus symptoms? What's being done in research on tinnitus treatments? Tinnitus Slideshow: Why Are My Ears Ringing? Tinnitus is abnormal ear noise. Tinnitus can arise in any of the four sections of the ear: the outer ear, the middle ear, the inner ear, and the brain. Persistent unexplained tinnitus is evaluated with a hearing test (audiogram). Measures can be taken to lessen the intensity of tinnitus. Tinnitus is a symptom, not a disease, and it has a variety of causes that may arise anywhere in the hearing mechanism. It begins in the ear with the tympanic membrane and the cochlea, where sound is transmitted and transformed into electrical energy for the brain to perceive. Blood flow and/or tumors: Tinnitus that is throbbing (pulsatile) may be due to blood flow through arteries and veins adjacent to the ear, as well as tumors that are vascular, meaning that they have increased blood flow within them. Temporomandibular joint (TMJ) abnormalities may cause a repeated clicking sound in the ear. Damage to the vestibulocochlear nerve: Damage to the vestibulocochlear nerve responsible for transmitting sound from the ear to the brain may cause tinnitus. Causes may include drug toxicity or a tumor (for example, acoustic neuroma). Meniere's disease, which is associated with hearing loss and vertigo also may cause tinnitus. Aging: As people age, their hearing may decrease and there can be associated tinnitus. Otosclerosis: Otosclerosis, which is caused by abnormal bone growth in the middle ear, can sometimes cause tinnitus. Trauma may also be a cause of tinnitus and hearing loss. This includes barotrauma, whereby air pressure changes can damage ear function. Examples of barotrauma include pressure changes from scuba diving or changes in air pressure when flying. The sound of tinnitus may be constant or it may come and go intermittently. It may occur in one ear or in both ears. Most often, the sound is a high pitched continuous tone, but it may also be described by the patient as a click, buzz, or a hum. Tinnitus is often associated with hearing loss and the patient may complain of decreased hearing, even if the tinnitus is absent. Often tinnitus can be evaluated by a primary-care doctor or internist, but if consultation is needed, an otolaryngologist (ear, nose and throat doctor) is the specialist that evaluates and cares for people with tinnitus. Audiologists are trained to perform hearing tests and assessments. The patient's history and description of symptoms is the key in determining what might be causing tinnitus. Does it involve one or both ears? Does the sound pulsate, or does it sound like a rush or flow? Has there been recurrent exposure to loud noises or sound at work, at home or at play? Is there associated decreased hearing or hearing loss? Does the person feel a sensation of spinning (vertigo)? Medications: Be prepared to provide the health-care professional a list of medications including over-the-counter (OTC) and supplements to review since tinnitus may be a side effect of certain medications. Hearing test: An audiogram or hearing test may be performed to look for associated hearing loss in one or both ears. Imaging: Depending upon the suspected underlying cause of tinnitus, radiology tests may be performed to image the head and neck, including the structures of the ear. These imaging tests may include CT scan, MRI and ultrasound. Referral to a specialist: Consultation with the appropriate specialist may be needed, both for diagnosis and treatment. Tinnitus is a common complaint, with up to 15% of Americans having experienced it. It is the most common symptom reported by military service members returning from combat. Tinnitus may last for weeks or months, and then resolve spontaneously. For some people tinnitus may last for years. The tinnitus may be significant enough to interfere with an individual's activities of daily living. For this reason, treatment must also be directed at decreasing the effects of tinnitus on a person's daily life, such as depression, insomnia, etc. For those people whose tinnitus is caused by an adverse or toxic reaction to a medication, stopping the drug may allow the hearing mechanism to recover; however, talk with your doctor before stopping any medication. Sometimes the adverse effects of medications on hearing may be permanent. Electrical stimulation and repetitive transcranial magnetic stimulation are some of the other treatment considerations available for certain individuals with tinnitus. The following home remedies may be of benefit to some individuals with tinnitus. Benzodiazepine medications, including alprazolam (Xanax), may help suppress nerve function and decrease tinnitus symptoms. Corticosteroid injections into the middle ear may decrease inflammation in certain cases of tinnitus. Antidepressant medications may decrease the intensity of tinnitus or resolve the noise altogether. Moreover, antidepressants may also help with the depression that is sometimes associated with the presence of persistent and chronic tinnitus. Prostaglandin analogues, such as misoprostol (Cytotec), may be of some help in some people with tinnitus. There are some behavioral and cognitive therapies that have been successful in treating tinnitus. Seeking out a multidisciplinary program at a medical center that specializes in tinnitus may improve treatment success. While scientific research has not shown the benefit of acupuncture in the treatment of tinnitus, there may be a significant positive placebo effect. A variety of medications may be ototoxic (damage the ear) and cause tinnitus. If tinnitus develops while you are taking a medication, stop the medication and discuss other options with your health-care professional. Chen, YC. et al. "Tinnitus and hyperacusis involve hyperactivity and enhanced connectivity in auditory-limbic-arousal-cerebellar network." eLife. May 2015. Lehner A. et al. rTMS for the Treatment for Chronic Tinnitus: Optimization by Stimulation of the Cortical Tinnitus Network. Tinnitus Today, Summer 2012. Meng Z, et al. Repetitive transcranial magnetic stimulation for tinnitus. Cochrane Database Syst Rev 2011 Oct 5;(10). University of San Francisco Medical Center. "Tinnitus Signs and Symptoms." Are ear infections contagious? Learn ear infection home remedies, signs, and symptoms. Learn about ear infection treatment, as well as the difference between inner ear infections and middle ear infections (otitis media). What was the cause of your case of tinnitus? What symptoms did you experience with tinnitus? What treatments have been effective in treating tinnitus? What steps have you taken to prevent tinnitus? What type of therapy or remedies have been effective in treating tinnitus? What therapies have you found to lessen the symptoms of tinnitus? There are three sections of the ear, according to the anatomy textbooks. They are the outer ear, the middle ear, and the inner ear. 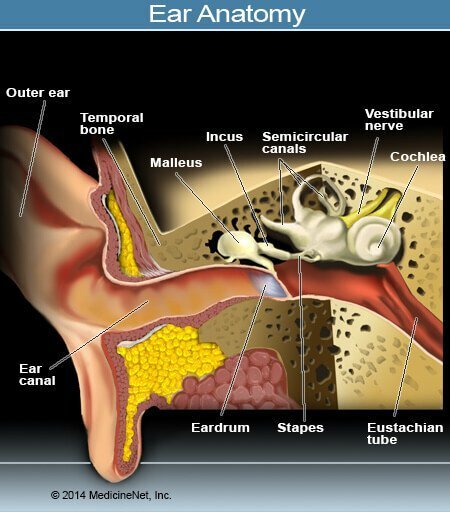 See a picture of Ear Anatomy and learn more about the health topic. A perforated (ruptured, punctured) eardrum (tympanic membrane) is a hole or tear in the eardrum. The eardrum separates the ear canal and middle ear. Most ruptured eardrums do not cause pain, however, the condition can be uncomfortable. Bacteria, viral, and fungal infections are the most common causes a ruptured eardrum. Earwax removal attempts, changes in air pressure, and trauma are other causes of a ruptured eardrum. Most people do not need medical treatment for a ruptured eardrum, however, some may need surgery depending upon the cause and size of the hole in the eardrum. REFERENCE: Cleveland Clinic. "Ruptured Eardrum (Perforated Tympanic Membrane)." Updated: Aug 208, 2014. What is tinnitus? Explore tinnitus (ringing in the ears) causes, symptoms, relief remedies, treatments and prevention tips. Learn about pulsatile tinnitus.